Day 02 In Kathmandu to make final preparations for your trip to Tibet. If you are sufficiently prepared then sightseeing of Patan Durbar Square, Swoyambhunath and Boudhanath. Day 04 Drive through Nyalam , via the the Lalung Leh to Old Tingri. Day 05 Drive to Shigatse and visit the Tashilunpo Monastery. Day 06 Early morning departure for Gyantse, sightseeing before continuing on to Lhasa via Yamdrok Tso (the Turquoise Lake). 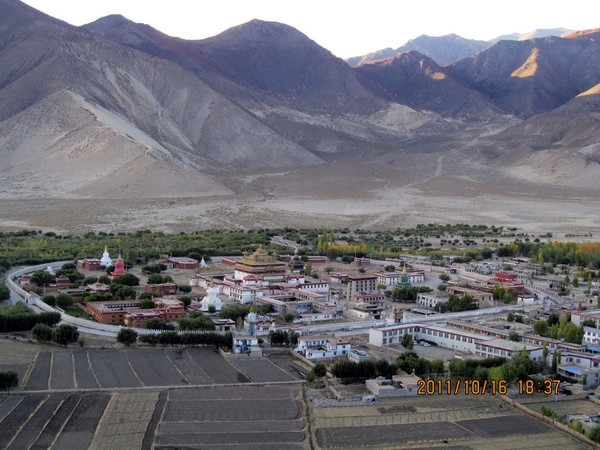 Day 08 Sightseeing of Lhasa including the Drepung monastery, the Jokhang Temple and the Barkhor Bazaar. Day 10 Trek to the village of Hebu. Day 11 Climb up to the Jooker La for stunning mountain views, descend. Day 12 Trek up to Sukhe La, descend to a valley and grassy meadows. Day 13 Descending to the left bank of the river. Day 14 Trek to Samye Monstary and Sightseeing. Day 15 Cross the Yarlung Tsangpo (Brahmaputra) River by ferry and drive to Tsetang.. Sightseeing of Tsetang. Day 16 Transfer to airport and fly to Kathmandu. Day 17 Sightseeing in Kathmandu including Kathmandu Durbar Square, Pashupatinath and Bhaktapur Durbar Square. Day 18 At an appointed time transfer to the airport and for your departure from Nepal.